Including podcast recaps, we published more than 500 (!) posts this year on Convince & Convert. Our goal is to give you information, analysis, and insights you can’t get on all the other marketing sites out there. We do it this way because more than 70 percent of our readers have been in marketing for six years or more, and nearly a third have been doing it marketing-style for 15+ years. In short: Convince & Convert is the home base for the experienced digital marketer. We’ll be finalizing our 2017 editorial calendar soon. We’ll keep it pretty much the same I think, but we’re for sure adding regular features on social media customer service—a huge trend next year, and also something with which we have a lot of experience on the consulting side of our business. Jess Ostroff, our Managing Editor, recently sent me the list of 2016’s Top 10 posts, ranked by page views, and we’re going to re-run each of them this week, two per day, to give you a fresh glimpse at the content you liked best this year. Statistics and research and content marketing were big trends for us in 2015 as well. The other two are new, and I can’t wait to see what bubbles up in 2017. Based on a study from my friend Tom Webster and Edison Research, this post lays out the staggering growth of podcast listenership in the USA. Remarkably, this is another post based on a different section of the same research report from Edison. Stats are catnip! A terrific summary post (with lots of statistics included) that showcases top of the funnel, mid-funnel, and bottom of the funnel video use cases. Nice job from a guest contributor from Explainify. I wrote this post on-the-fly, when I saw Southwest’s Facebook Live video explaining how they were handling their massive cancellations earlier this year. I don’t write spur-of-the-moment much anymore (my schedule is more crazy than it used to be, and our editorial calendar is more locked than it used to be), but every once in a while you can catch lightning in a bottle, like the old days of blogging. This is one of my personal favorites of the 60 or so I wrote this year. Another post in the statistics and data realm, this is one I wrote based on some fascinating research from our former partners at TapInfluence, who managed to pin down precise (and very strong) ROI for influencer marketing programs. This one combined two trends: stats and influencers. A fantastic, detailed, process-driven post that includes step-by-step instructions and examples. A great list post from Thiam, who runs an inbound marketing agency in Singapore called 3Pal. From last January, this is my story of our company-wide retreat in Mexico, and a remarkable interaction with a waiter who absolutely NAILED how to ask for a review on TripAdvisor. I now use this lesson in many speaking engagements too. Nice guest post and trends summary from Joei, who does content marketing for the social listening tool Mention. Prediction posts are everywhere, but Joei nailed it here and ended up with more page views than my own predictions post! I’ve known the very smart Kathy for years. She’s the founder of Keeping it Human, a business storytelling consultancy. She uses that background to great effect on this post, where she documents all the ways businesses can use the red-hot live-streaming video options. One of the best posts this year in the use of graphics and screenshots. Rahul is managing director at digital agency Custom Creatives, and he spills the beans here on precisely how to run the reports that matter. Super useful! Huge thanks to all of our contributors for sharing their wisdom with our community this year. Big hugs also to Kelly Santina, who leads our Media division, as well as Jess and our editorial team for keeping the Convince & Convert machine oiled and operating. Can’t wait for next year! 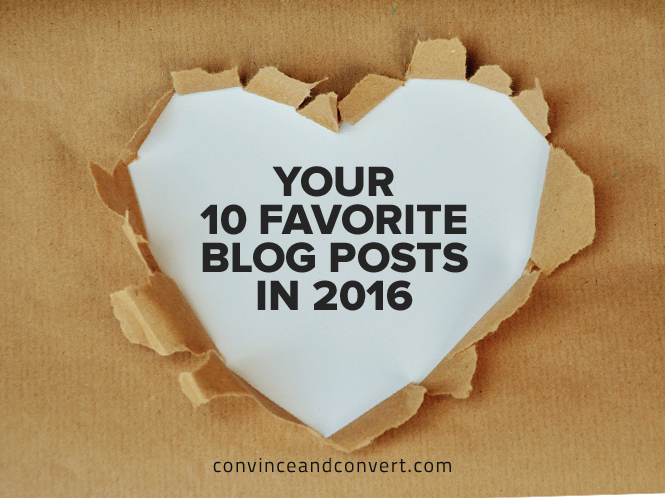 Enjoy this week, as we re-run the top 10 blog posts of 2016.